The Secret to Making Tasty Cocktails Quickly and with Ease! Have you ever wanted to make delicious cocktails like a professional bartender? Well, now you can. 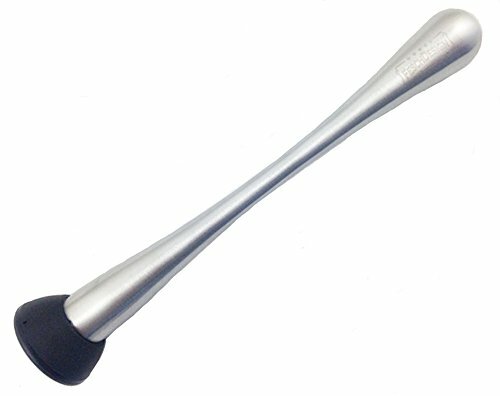 This extra long and high quality stainless steel cocktail muddler helps you easily mash and break up the citrus fruits, herbs, spices etc. even in taller glasses and mix the drink quickly. It's really versatile. The ABS foot has just the right pattern of bumps to extract flavor from herbs, citrus, berries, etc. without completely obliterating them. With its elegant design and nice little box, it's definitely a great housewarming or birthday gift. What are the benefits and special features of this muddler? • Food-safe grooved ABS head for easy mashing of citrus fruits, herbs, spices etc. Buy 3 now to get FREE shipping. Hurry up before the limited-time special bonuses disappear! Get it now, click the "Add to Cart" button and buy Risk-Free. Besides the 90-day regular money back-guarantee, you also get 100% lifetime guarantee (with email registration)! ✓ TOP-QUALITY & EASY-TO-USE - Made of high quality food-grade stainless steel certified by FDA, the muddler is professionally designed so that you can easily make delicious and refreshing cocktails such as Mojito, Caipirinhas, Mint Julep etc. ✓ GROOVED ABS HEAD - The food-safe ABS head protects your glassware from scratching or breaking and is firmly affixed to the smooth stainless steel handle for easy mashing of citrus fruits, herbs, spices etc. ✓ SATISFACTION GUARANTEED - If the muddler breaks during normal use we will replace it. It's that simple! Now with limited-time special bonus: Complimentary Cocktail Recipes eBook + LIFETIME GUARANTEE (upon registration, details per email). So order this premium quality muddler by adding it to the shopping cart now! If you have any questions about this product by FeschDesign, contact us by completing and submitting the form below. If you are looking for a specif part number, please include it with your message.